Fifteen astronomers and planetary scientists from the American Astronomical Society (AAS) visited Capitol Hill on Wednesday, 13 March 2019, to advocate for strong, sustained federal support of the astronomical sciences — astronomy, planetary science, and heliophysics — and of programs that the scientific community itself has prioritized by consensus. 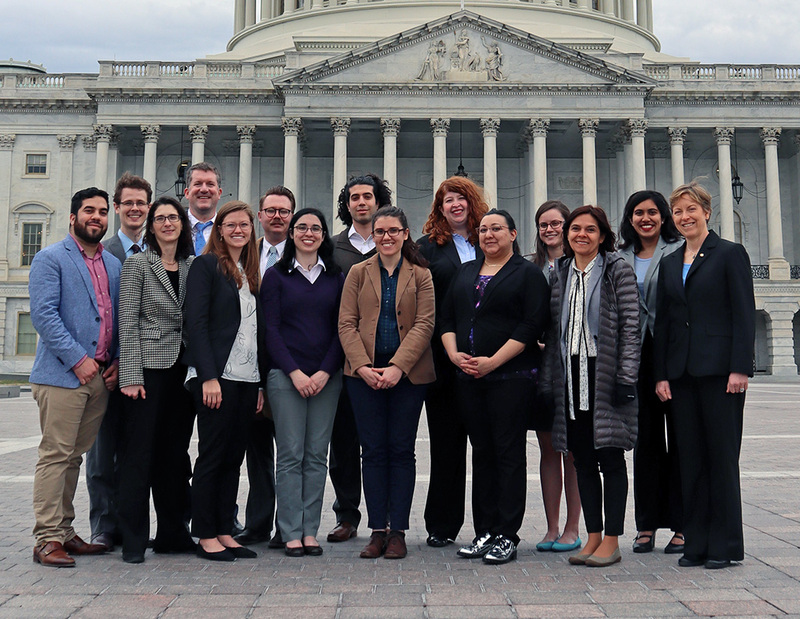 Traveling in teams of volunteers led by staff and volunteer science advocacy experts, the group collectively held 43 meetings in offices of senators and representatives from 15 states. 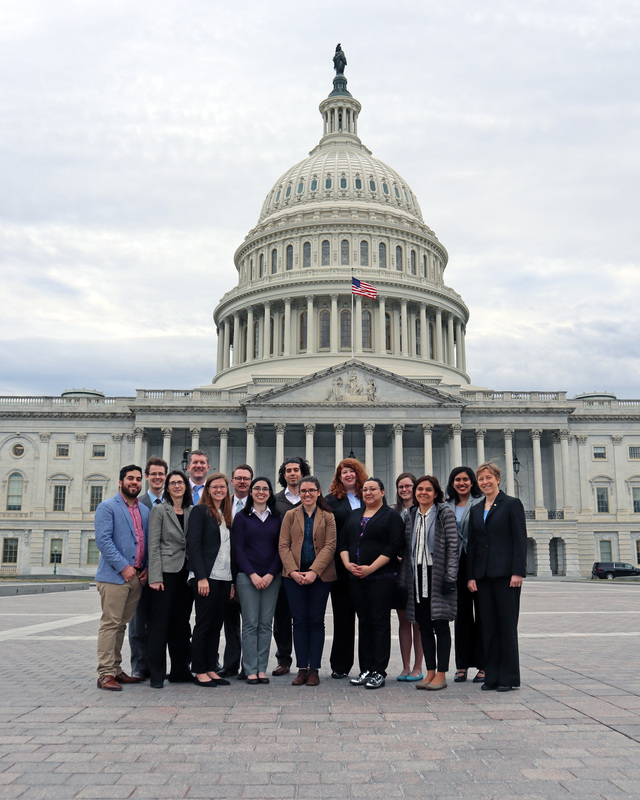 The AAS brings member volunteers to the Hill for its Congressional Visits Day (CVD) program every spring, typically coinciding with the start of Congress’s formulation of spending packages for the coming fiscal year after release of the president’s budget proposal. The AAS public policy staff, elected leaders, and Committee on Astronomy and Public Policy (CAPP) jointly develop congressional “asks” for spending at the National Aeronautics and Space Administration (NASA), the National Science Foundation (NSF), and the Department of Energy (DOE) Office of Science, in coordination with coalitions of stakeholders across disciplines. These priorities are woven into the messages CVD participants bring to the Hill, but AAS member volunteers are also able to bring their own personal stories about the impact of federal investment in the astronomical sciences to themselves and their home institutions, districts, and states. Participants brought messages to Capitol Hill on the importance of community-derived priorities provided in the National Academies’ decadal surveys and the value of the astronomical sciences as part of a strong US portfolio of discovery research. Such advocacy is particularly useful at the start of a new Congress, as our volunteers are able to provide a timely education to many new staffers and freshman representatives and senators. AAS members thanked Congress for the final fiscal year 2019 spending package, which avoided another shutdown and brought increased federal spending across the astronomical sciences at NASA, NSF, and DOE. Many discussed the impacts of the recent partial government shutdown, which shuttered science agencies for more than a month and caused delayed grant reviews and deadlines; lost or delayed paychecks to federal workers, contractors, and sponsored postdoctoral fellows; and missed opportunities for scientific collaboration and communication. Though the administration had only released the overview of the president’s budget request just two days before this year’s CVD, the AAS members were still able to convey strong opposition to proposed cuts to science at NASA, NSF, and DOE, which would be devastating to the astronomical sciences. The requested sharp cuts to NASA astrophysics, for example, would force the cancellation of the Wide Field Infrared Survey Telescope (WFIRST), the next top-priority large space mission of the astronomy community after the James Webb Space Telescope (JWST), which is on track to launch in 2021. CVD volunteers also shared the AAS’s strong support for the Combating Sexual Harassment in Science Act of 2019, a bipartisan bill introduced at the start of the new Congress. Referring to the National Academies’ study Sexual Harassment of Women: Climate, Culture, and Consequences in the Academic Sciences, Engineering, and Medicine, AAS President Megan Donahue (Michigan State University) wrote, “Implementing the recommendations is crucial to ensuring that science agencies and grantees adopt new sustainable, holistic, and evidence-based policies and practices that address the pervasive occurrence of sexual harassment in academia, its impact on individuals pursuing careers in STEM, and the integrity of the federal research enterprise” in a letter supporting the bill upon its introduction. Before visiting Capitol Hill, the volunteers participated in training activities at the AAS Executive Office in downtown Washington, DC. Over a day and a half, participants learned about the roles and experiences of congressional staffers, the federal budget process, the decadal survey process, the specific opportunities and challenges in the current budget and political landscape, and how to effectively communicate their messages. In providing this training, the AAS prepares volunteers not only for the CVD visits, but also for maintaining positive relationships with the offices they visit and, more broadly, for being actively engaged in science and space policy throughout their careers. A group of astronomers, solar physicists, and planetary scientists from the American Astronomical Society visited Capitol Hill on Wednesday, 13 March 2019, to advocate for robust federal investment in the astronomical sciences. Photo courtesy Joel Parriott (AAS).